- Our after bath body oil is specially formulated to a lightweight texture using blends of organic vegetable oils for easy and quick absorption on moist or dry skin. Infused with sensuous rose and patchouli essential oil, our after bath body oil intensely hydrates the skin giving it an instant glow. A light massage invigorates and revitalises the senses. - Ingredients:- Fractionated Coconut Oil, Organic Coconut Oil, Organic Sesame Oil, Sweet Almond Oil, Organic Safflower Oil, Organic Rose Oil, Patchouli Oil, Vitamin E.
- Rose oil helps retain moisture in the skin so it can be used on all skin types. It has got anti-inflammatory properties so it also acts as a skin protectant, while patchouli helps to treat chapped skin. 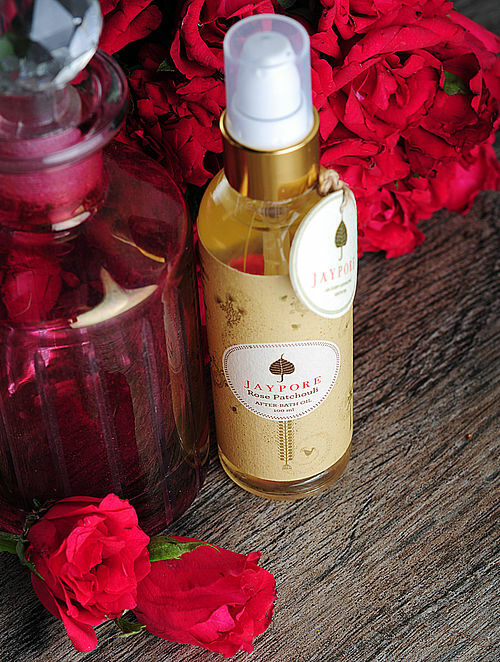 This After-Bath Oil can be used on any skin type but is highly recommended for ageing skin.